We sat around the table in my dining room as we did each week. Sipping tea, drinking coffee, but most importantly praying. It was a day much like today. We were part of a Pentecostal church, where giving words of knowledge in voices that roared as if having to make their way from the Heavens themselves were common place. God didn't speak to me that way. It was never taught directly, that this was the only manner that God spoke, but to the one who didn't receive Him that way, the message was whispered to me, if only by my own insecurities. As we prayed that winter morning, I felt a nudge. A something that most certainly was not me. I was supposed to tell her something. Encourage her. But I had no idea what. I walked her out that morning, down the cement steps to the driveway. There was a light covering of snow, but the sun was shining warm that week and it was melting off, leaving bits of earth showing beneath its white blanket. That's when I saw it. 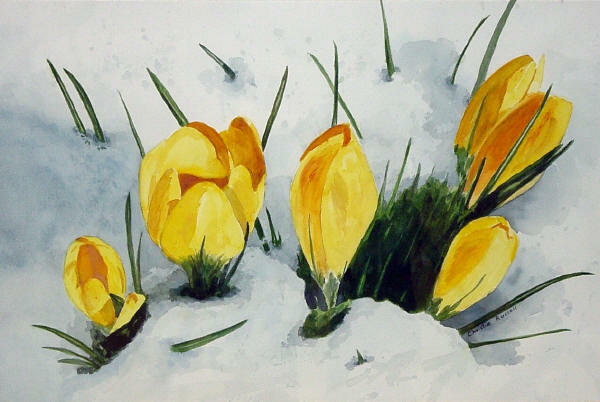 Outside of our garden, lined with bricks, were small bunches of crocuses, peeking out from the snow. January. Winter. Yet underneath the snow life was budding. Blossoming. I felt a fire in my belly. "Hey. I just feel like I am supposed to tell you that even though this season of your life feels hard and lifeless, that God is doing something that you can't see yet. There is life and it's already forming. It's already there. It's peeking out." January is deceiving. It is full of dark days that leave me wondering if the sun has left, has abandoned Chicago for a more exotic locale, and if it will ever return. The darkness wraps around my soul, choking the hope out of my heart. The days feel so long. But the crocus reminds me that the sun hasn't left. It hasn't abandoned me. There are new things going on underneath, in the places I can't see. A new season is coming. This season in my life is about shedding the old. Walking away from the past. Not letting my failures and disappointments define me. Remembering that I have not been abandoned, but that my perspective does not allow me to see what is already shifting. For I am about to do something new. See, I have already begun! Do you not see it? Each morning when I wake I have a bit more hope. And I feel a bit of that fire in my belly that used to be there. I see the glory dance around me. The beauty of design and purpose and plan and partnering. My spirit is lighter and the air is crisp here. And the sun shines warm on my face. Thank you. I loved your piece and found it so life giving! Oh my friend what a gifted writer and hope you are. Love this. And that you saw a crocus! That passage from Isaiah spoke to me during some really dark days. And crocuses (crocii?) poking through the snow in winter? Need them desperately! So glad you responded to the Spirit's prompting. And were encouraged in return. That's a beautiful image to remind us of God's unseen work in our lives, Brenna. Thanks so much for sharing these thoughts and the beautiful artwork by Emily that seems "custom-made" for your article today! Thanks for stopping by, Beth! I googled images after I wrote it and it was the second one to pop up....I considered it a God thing!! Another Brenna! Found you from Emily's blog. Thanks for the encouragement :) Keep hoping, even when it doesn't make sense to. There aren't many of us, are there? Thanks so much for YOUR encouragement! Beautiful words. I love Emily's painting as well. Thank you for stopping by. So grateful. That's always been one of my favorite verses. I drove our kids to a local greenhouse/nursery today because we've been sick for weeks on end and needed a reminder of spring! It is so important to remember that these are all seasons....meant for a short time....meant to usher in the new. Oh Brenna, I just love that fire in your belly and the hope here that is returning, bit by bit, each morning. I love the crocus pushing out beneath wintery snow imagery and the scriptures you shared. And again, having been at a Pentecostal church for a long season of life, relating to that unspoken pressure (or perhaps, as you said, insecurity) of not hearing God like everyone else. Not in the loud, but in the simple, in the quiet, in the every day. I so get that, friend. I love love love how God spoke to you and continues to speak to you. Thank you for sharing this. Thank you for reading. Our current church is so gracious and gentle and encourages everyone to hear God how they are wired. It is so encouraging! "Walking away from the past. Not letting my failures and disappointments define me." Wow - that's exactly the phase I think I am entering now. The past year was largely about coming to grips with my shortcomings and failures, embracing the disappointment, and this year I think it's time to move on. It's just SO encouraging to know that I'm not the only one in that boat - thank you! YES! It's a deliberate choice. Walking it out each day. It can be so tiring but I know it is worth it! this made me want to cry. i love the crocus. i love the hope it symbolizes. bless you sweet friend. Thank you. And thank you for your gorgeous painting. It's the closest I have to a real crocus here in the city, so I keep looking at it, feeling encouraged! "Not letting my failures and disappointments define me." I am walking through this too. Lately, everyday has been heavy. Thank you for sharing this. I am encouraged just by being reminded I am not alone in going through all these. Thank you for visiting. I will be praying that your days begin to feel lighter and you are able to recognize each morning the newness that the Father has given us. Blessings! Beautiful words and of course Emily's picture is awesome. I don't know you well, Brenna, but you write with such gentle demeanor, such a quiet spirit, I can't imagine it being hard for you to find encouraging words to give to a friend. I really know what you mean about failures from the past wanting to define you. So many things call out to me, too. Trying to name me. Such a current issue in my life -- that part of your post jumped out and grabbed my heart. A beautiful reminder that most of what God is doing in our soul is hidden underneath the surface, the beauty of His work revealing itself to others at just the right time. The way you were obedient to speak life into a friend. Glad I stopped by here today.